If you need to make charts online then ChartBlocks can be very helpful. It is an online chart building tool that you can use to create charts for your data dashboard. You can create a free account but as soon as you get signed in you will be tempted to upgrade to a premium account. The free account let you create up to 30 online charts with 50 sets and access for only one user. Right after creating your account, you can follow the wizard that will guide you through the chart creation process. 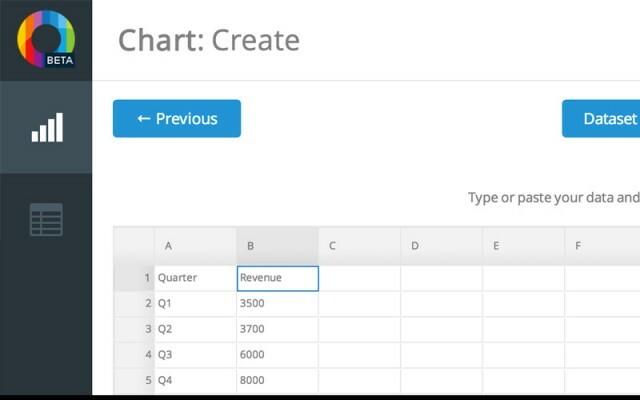 In the web-based spreadsheet editor you can enter the chart dataset or you can upload a spreadsheet from your computer. Just for testing purposes, we have added a very simple data table with the Quarter number (Q1 to Q4) in the first column and the Revenue in the second column. Then you can move to the next step and choose the Chart type. There are many different options to choose, for example you can pick a Bar Chart type with columns, a Line chart, an Area or Stacked Chart, a Scatter Plot or even a Pie Chart, Donut chart or Election chart. By moving forward to the next steps, you can then finish the chart design and get the chart ready for export or share it online. Finally, you can embed the chart in any webpage. Data chart tools like these are very useful where we need an online tool to support us during the creation of an original and unique chart style for our presentations or dashboard. The interface of ChartBlocks looks really awesome and it is very intuitive even for a novice user. Be aware the free version is quite limited and by default all your charts are publicly available. If you are using sensitive this can be an inconvenience.